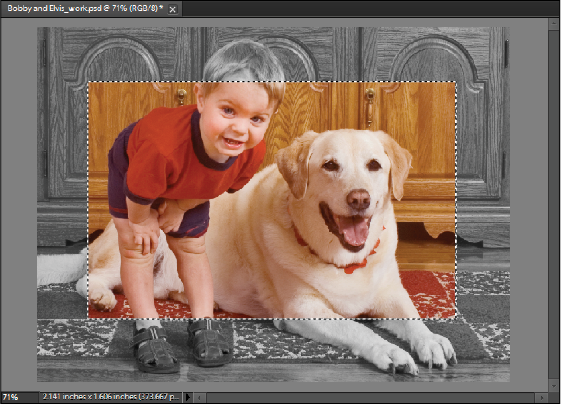 This tutorial provides you with a foundation for working with Adobe Photoshop Elements selections. It is the fifth lesson in the Adobe Photoshop Elements 10 Digital Classroom book. Selections define the editable pixels in a photograph. They allow you, for example, to darken one area in a photo without affecting the rest. Selections can be made with either a selection tool or a selection command. A selection outline surrounds the selection, and can be hidden. You can edit the pixels inside a selection border, but you can’t access pixels outside the selection outline until you deselect the selection. Selections define the editable areas in a photo. Photoshop Elements provides selection tools for different kinds of selections. For example, the Rectangular Marquee tool selects square and rectangular areas, the Magic Wand tool can select an area of similar colors with one click, and freeform selections can be made with one of the Lasso tools. Further, you can smooth the edges of a selection with feathering and anti-aliasing. Selection tools can be found in the Toolbox, which is located, by default, on the left side of the workspace. Photoshop Elements provides you with different selection tools for different selection needs. The Rectangular Marquee tool draws square or rectangular selections. The Elliptical Marquee tool draws round or elliptical selections. The Lasso tool draws freehand selections. The Polygonal Lasso tool draws multiple straight-edged segments of a selection. The Magnetic Lasso tool draws a selection that automatically snaps to contrast edges you drag over in the photo. The Magic Wand tool selects pixels of similar color with one click. The Quick Selection tool automatically makes a selection based on color and texture when you click or click-drag an area. The Selection Brush tool automatically selects or deselects the area you paint, depending on whether you’re in Selection or Mask mode. The Smart Brush tool applies color and tonal adjustments and effects to a selection. 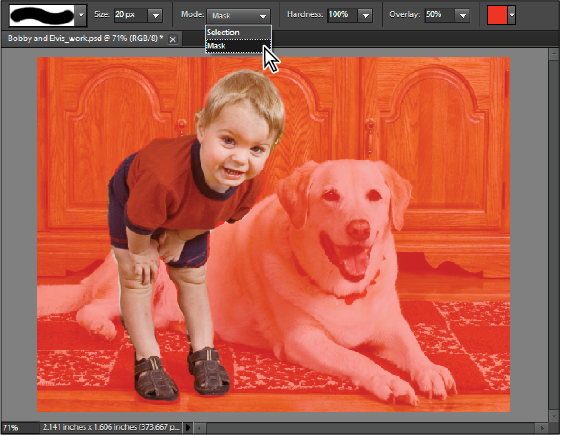 The tool automatically creates an adjustment layer for non-destructive editing. 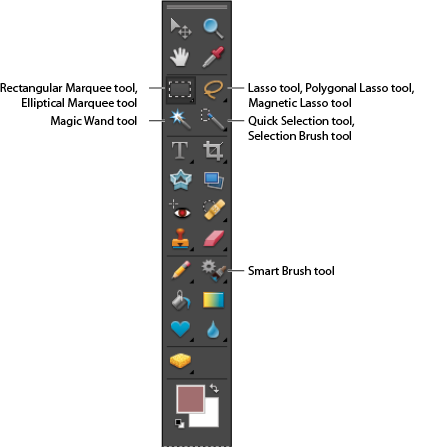 In this exercise, you’ll use one of these tools, the Selection Brush tool, to work with selections. You can make selections in two ways using the Selection Brush tool: in Selection mode, by painting over the area you want to select, or in Mask mode, by painting out areas you don’t want to select using a transparent overlay. You can also start with a rough selection made with another selection tool, and then fine-tune your selection with the Selection Brush tool. Also, you can add to or subtract from the selection by choosing from the Selection brush tool options. Choose from Selection Brush tool options to fine-tune your selection. A. Add to selection. B. Subtract from selection. C. Brush drop-down menu. D. Brush size. E. Mode. F. Hardness. 1 Select the Selection Brush tool ( ) from the toolbox. If necessary, click and hold on the Quick Selection tool ( ) in the toolbox and select the Selection Brush from the list of nested tools that appears. Next, you’ll set Selection Brush tool options in the Options bar at the top of the workspace. 3 Choose the Hard Round 13 pixels brush from the Default Brushes drop-down menu. 4 Increase the brush size to 20 pixels by dragging the Size slider to the right, by clicking on the word Size and dragging to the right, or by typing 20 in the size field. 5 From the Mode drop-down menu, choose Selection to add a selection to the image. 6 Set the brush tip’s hardness to a value of 100 percent for a crisp edge on your selection. 7 Click and drag in your photo to select the boy in the image. Don’t worry if you select too much, you will edit your selection in the next steps. 8 From the Mode drop-down menu, choose Mask to switch to Mask mode. The red overlay shows areas that are masked, or not currently selected. You can use mask mode to remove areas from your selection. 9 Paint out any areas that you’ve selected in error by dragging with your cursor (brush) outside of the edge of the boy. You are now removing selected areas from the selection. Zoom in if necessary for finer control. 10 Choose Selection from the Mode menu to return to the Selection mode. Subtract from a selection while in Mask mode. You can add to or subtract from an existing selection to adjust selection borders. 1 Choose any Selection tool, and hold down Shift (a plus sign appears next to the pointer) to add to the selection, or hold down Alt (Windows) or Option (Mac OS) (a minus sign appears next to the pointer) to subtract from a selection. Then select the area to add or subtract and make another selection. 2 In the Options bar, click Add To Selection or Subtract From Selection and make another selection. Add to or subtract from a selection using settings in the Options bar. Anti-aliasing and feathering are terms that refer to smoothing the hard edges of a selection. 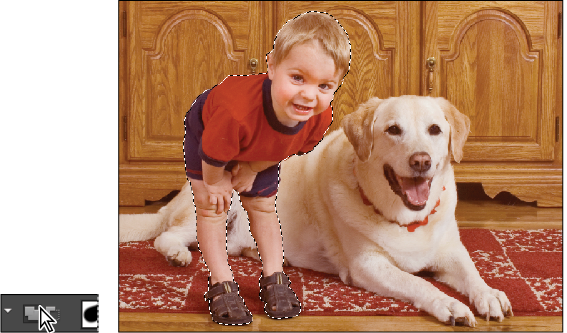 Anti-aliasing smooths the jagged edges of a selection by softening the transition between edges and background pixels. Because only the edge pixels change, no detail is lost. 1 Select the Lasso ( ), Polygonal Lasso ( ), Magnetic Lasso ( ), Rectangular Marquee ( ), Elliptical Marquee ( ), or Magic Wand tool ( ). 2 In the Options bar, notice that Anti-alias is selected by default. It is best to keep this on for most selections.